Basic Life Support CPR this course is updated with the 2015 Update Guidelines and teaches both single-rescuer and team rescuers basic life support skills and application for both pre-hospital and interfacility environments primarily focusing on high-qualtiy CPR in conjunction with good team dynamics. In addition, it teaches up to 6-rescuer CPR skills verses the old 2-rescuer CPR skills. This instructor-led course allows students to participate in simulated clinical scenarios and learning stations. Students with the Instructor work to complete the various BLS skill practice stations and testings. Students must complete a written exam and receive a score of 84% or higher to successfully pass the class. 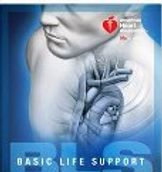 AUDIENCE: This course is for those in the healthcare profession (certified / non-certified or licensed / non-licensed) who need a course completion card in Basic Life Support in order to meet certain job, regulatory, or other requirements. This course DOES NOT teach First Aid. If you need a First Aid certification, see our Heartsaver First Aid course. COURSE FORMAT: This course is classroom-based which includes instructor, video, and skills interaction throughout the course. This course is approximately 4 - 5 hours in length. CERTIFICATION: Upon completion of this course, students receive an American Heart Association BLS CPR Provider course completion card that is valid for two years.